Howdy folks. My name is Brian and I just got into the antique fans. My wife bought me an Eskimo, and I got it running, so when I saw this Emerson 6250B for sale I couldn't resist. It was in very rough shape, and there was no cord so I didn't test it prior to restoration. I stripped everything down to bare metal and painted with the Rustoleum appliance epoxy. The finish is amazing now. On the blades and cage i used satin enamel. I cleaned up all the internals, and rewired it. Im still waiting on a new decal for the cage badge. It is running great, but there is some back and forth play in the blade, about 1/8". If the head is angled slightly down, allowing the blade to move forward, it runs completely silent. If the head is level or tilted up, there is friction noise and the blade moves slightly in and out as it runs. I'm asking what to do from here. I'm thinking I will need to take it apart and add some washers on the rotor? The epoxy has only been done for about a week, so I will probably need to let it harden for another week before I attempt this. I'm pretty disappointed because I'm sure I will damage my flawless paint job during this process. I would appreciate any advice on getting this beauty running totally silent. Thanks. Welp, lesson one, you learned. The paint job is practically last, with some "leave it for later" touch up. I prefer to run a fan before doing much more work. Proper shimming with thrust washers will cure your problem. New fiber washers can be rubbed on a file if you need to adjust the play to a minimum. Black fingernail polish is a great touch-up paint and can be smoothed with wet/dry sand paper. Since it is lacquer, clear lacquer will "burn in" allowing a seamless touch-up. I don't know if there is a tutorial on shimming. That fan should be easy. The hardware or autoparts store should have what you need. Try and position the rotor where it wants to live, or beside that, centered in the stator. 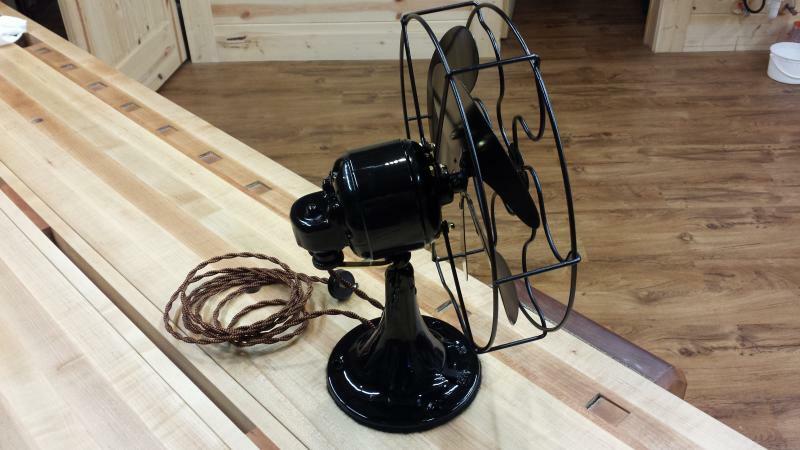 I like my fans tight, others may disagree. .020" is too much for me, but should be fine. That is about the thickness of a beverage can pull tab. ace hardware might have the shims/spacers that would work for that. 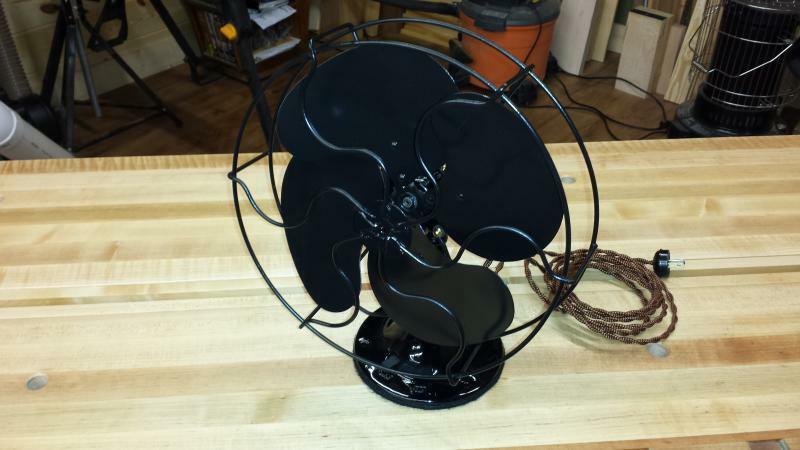 have the fan level & turn it on-- watch which direction the rotor moves(forward /backward) when you shim it try to put the rotor in the position it moves to upon start up. What type of washers should I use to take up the slack? Brian Behrens wrote: What type of washers should I use to take up the slack? The motor should have fiber washers in place. Just match the diameters. Fiber washers are usually a pinkish red color or a greyish black color. Use them along with or instead of the original washers, depending on what adjustment is needed. If the stack works out too thick, a new washer can be rubbed on a 2nd cut or smooth file to thin it down a bit. If I understand this correctly, I am just adding washers and reassembling, testing the fan, and using trial and error to get it right. Pretty much. Just make sure the rotor is centered inside the stator, keep the spacing even. Brian, the fan looks great. The decal went out Friday in the mail. Beautiful fan! I have 4 6250’s ranging from 1938-1953. They are my favorite small desk fans. 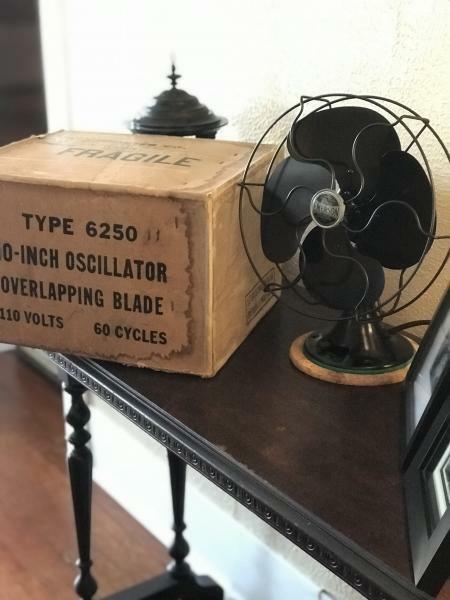 Yours appears to be pre-1950 for sure, my guess is late 1930’s.Here’s a pic of mine that is very similar to yours, with the one caveat being I got the original shipping box from 1939 with it! Page processed in 0.1579 seconds (12% database + 88% PHP). 29 queries executed.